Two terrorists aligned with ISIS took hostages during a morning Mass in Saint-Etienne-du-Rouvray in Normandy France. The Muslim terrorists forced Fr. Jacques Hamel to kneel at the altar and then they slit the throat of the 84 year old curate as they reportedly videotaped the brutality. Vatican spokesman Fr. Federico Lombardi. S.J., lamented the martyrdom of Fr. 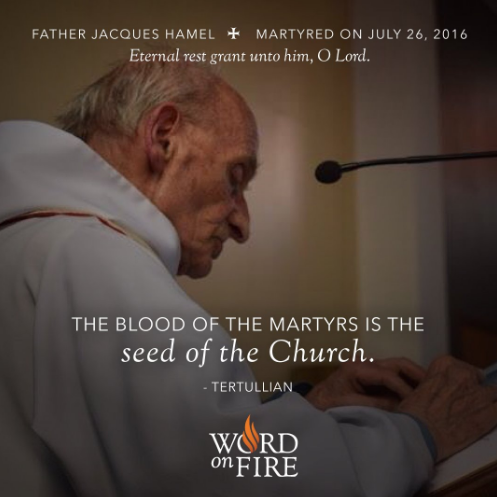 Hamel, noting: “We are particularly stricken because this horrible violence occurred in a church — a sacred place in which the love of God is proclaimed — with the barbaric killing of a priest."